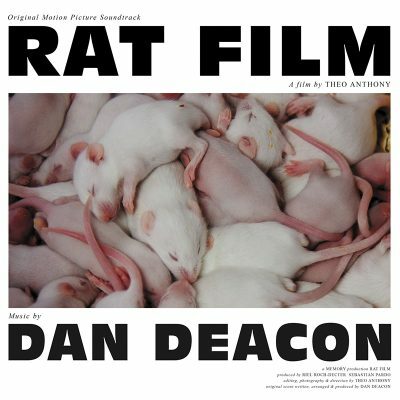 If you asked me who would be my top pick to soundtrack a film about the intersecting lives of rats and humans, my last option would be the musician whose last release was a sugary dance-anthem called “Change Your Life (You Can Do It).” Then again, Dan Deacon has never been a one-dimensional artist, and though there’s often a brevity and cheeriness to his music, there are a few glimpses of Deacon as a darker, more distressed composer (look specifically at the “USA” suite that closes out his 2012 record, America). It’s this side of his musicianship, along with a more nuanced and subtle style of writing, that brings him success on Rat Film. Even removed from the footage, many of these tracks still deliver strong emotional characters. Save the opener and closer (which are variations of each other), each track works off of an instrumentation and style that’s nearly unrecognizable from the cut before and after it. However, while the sonic palette is wide, there are a few unifying elements of composition that hold the album together. Deacon uses ambient clichés like rhythmic phrasing and harmonic overlay frequently, but he’s so good at manipulating these elements that a little reliance on convention is forgivable. While the nostalgic synthesizers of “Horn Phase” might initially sound musical worlds apart from the dissonant, screeching strings of “Harold’s Lament,” the way that the music will move through many emotional and tonal centers almost unnoticeably binds the two. Outside of these more abstract, ambient tracks lie some wonderful cuts with a bit of force—or at least identifiable rhythm—to them. One standout is “Pelican,” which takes the dreamy atmosphere of the first half of the record and gives it a little more momentum. The sliding bass melodies and dampened tom beat make this sound a bit like an AOR riff on painkillers as the music slumbers along its runtime. Rarely does music sound this laid-back and careless yet still maintain a steady drive and purpose. The second half of the record moves away from serenity and toward darkness and conflict, reaching its apex during “Video Game.” A deep, distorted synthesizer line swells and contracts throughout, with creaking thin tones on one end and booming, monstrous chords on the other. Everything is grounded by a rattling, percussion-like keyboard that speeds up and slows down throughout, following the shifting energy of the harmonies. There’s an odd stretch of tracks in the middle of the album (“Harold” to “Seagull”) that are all short, underdeveloped synthesizer ideas. It’s doubly frustrating to not only see these interesting and well-composed remains as fragments themselves when Deacon goes on to show off how well he can craft longer, more expansive tracks on the rest of the album. The soundtrack format suggests that these are one-time examples of motifs that occur frequently throughout the film, but it still feels like Deacon missed an opportunity to see these tracks through to their fullest ends.